Verastile - Designed for 0.2ml tubes (strips or trays), 96-well and 384-well microplates, 0.5ml, 1.5ml, 5ml tubes. Specially Formulated - Cool Bricks maintain a constant temperature (1°C or –10°C) for up to 10 hours. Quality Engineering - Each aluminum Cool Chamber surrounds tubes to guarantee sustained cold temperatures. Durable - The CoolSafe box is made of triple density expanded polystyrene and molded under extreme pressure creating a durable container that guarantees temperature stability. Easy To Use - Easily interchange Cool Chambers and Cool Bricks for different sized tubes. 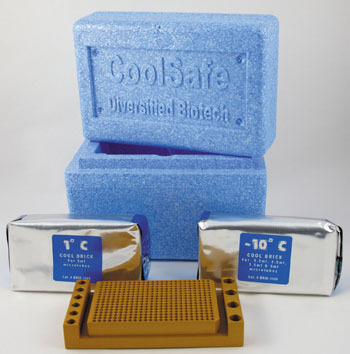 For maximum cooling results freeze bricks overnight: 1°C Brick in standard freezer -10°C Brick in a -80°C Freezer. Multiple Bricks can be used in rotation to maintain desired sample temperature.